I couldn’t afford to go to 4Cs this year – or, any year for that matter. I’ve never been. To any conference. Anyway, that’s a conversation for another time. 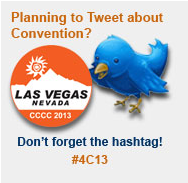 Because I knew about the conference this year, and I wanted to go, and I couldn’t, I stalked the conference on twitter. I’m not sure what to make of what I found there, so I’ll just share what I observed. First order of business was to figure out the right hashtag. I was not the only person wondering. It occurs to me that I don’t know the citation etiquette here. Do I black out people’s names? Get their permission? Everybody who tweeted about Cs is (surely) over 18, so at least there’s that. Will I have to delete this post later to be safe? 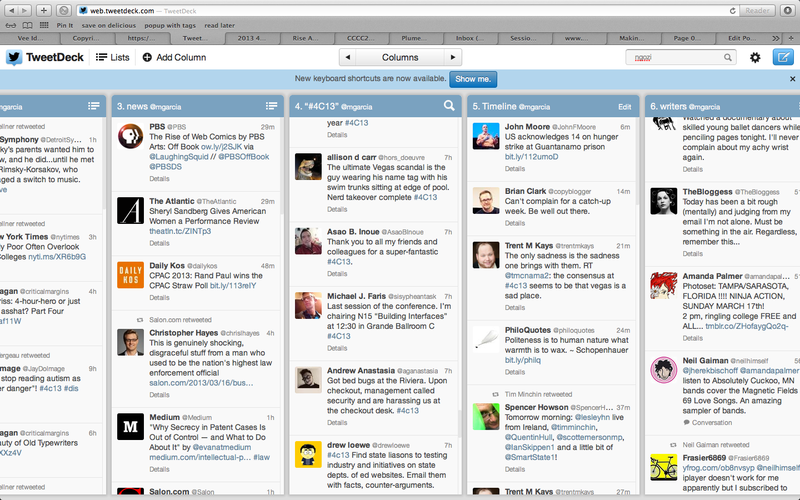 So I loaded it up in TweetDeck, and cruised the #4C13 column whenever I had 30 minutes or 4 hours to spare. but I think it’s fair to say that there were more tweets about the role of digital spaces/platforms/uses for writing instruction than other subjects. Perhaps people who were predisposed to tweet were likely to attend sessions about digital composing. Obviously, this method of eavesdropping only afforded me a tiny slice of the convention, and didn’t stretch to cover even the digital sessions that it might have been expected to. And Henry Giroux’s address got people fired up. It was a highly tweeted event. 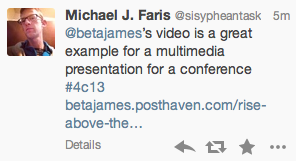 Tweets with twitter handles and presenter names were helpful when I wanted to search the web for more info. I often followed people whose presentations looked interesting and visited their websites (if they had them) for more of their research. Tweets with links to webpages, presentation slides and videos were few and far between, but much appreciated. They gave me an opportunity to think and say something in a way that tweeted observations and quotes did not. If twitter is a Burkean parlor, then linking to source material is a serious hand up in helping someone on the outside “join the conversation.” Because of people’s tweeted links, I watched @annetv’s video on the movement for coding literacy, I went through @trentmkays’s prezi on using twitter in his FYC course, and watched @betajames’s remotely presented video (with transcript) about learning management systems (LMS). Several presenters tweeted links to their handouts or transcripts of their talks, and the Cs site had a place where presenters could upload materials, though it didn’t seem much utilized. The “Creative Writing” folder had no uploads and the “Teaching Writing and Rhetoric” had 18, with most of the others having 3 or 4. The links go back to the landing page for the session, and occasionally there are no materials there. And though I don’t think I really got a feel for the conference experience, I concur with @ahhitt. I was happy to “attend” and attend to what I could find and sad to miss presentations by so many great people. I attended the AWP conference this year and found myself tweeting frequently during the events, but often about fairly mundane things like the lines in the bathrooms and how overwhelming the bookfair turned out to be. I hadn’t thought some folks at home might be reading and vicariously attending the conference! I also had some trouble nailing down an appropriate hashtag (switching from #awp to #awp13 to @awptweets in an attempt to get the right new followers and attention 😉 ), but I did find myself tweeting quite a few pictures. Many of my tweets were somewhat personal as AWP tends to devolve into a social gathering at some point, but I did get some good feedback from people who attended my reading and found me via the great interwebs. It’s an interesting balance between personal and professional at these events, and I think that was probably reflected online as well. The trend of digital events being tweeted is interesting, and the presentation of this post as a series of excerpted tweets (you have done the hard work of sifting for us, and we are still able to view the tweets in their original presentation as well as have some methods indicated for access like Tweetdeck) makes this post really engaging. Next time I tweet at these things I’ll try to remember someone might want to vicariously attend (and, in general, that someone might be READING what I twit-headedly tweet). I usually have this same reaction when SXSW happens every year, and perhaps reading all about it will eventually see us attending the conferences we are dying to see! I stalked SXSW this year too. So many good people! I was sad to miss John Green, Joss Whedon, and Amanda Palmer. Realistically, I might not have gotten into any of those events even if I were still in Austin, but I felt the loss anyway. Thanks for commenting! Tweeting in real time at the conference was interesting and exciting too!! I started following people whose sessions I was in and they would follow me right back (yay networking!!). And others’ tweets were a good way to get the low down on conflicting, concurrent sessions that I had to miss out on. I hadn’t quite thought about twitter as a way to welcome others outside the field in before the conference/your post; I think I was mostly preoccupied with how to use it to break into the convo myself, but that idea of using twitter to be more inclusive somehow is beautiful. I will redirect some of my twitter energies in that general vicinity!! So – some thoughts on my own tweeting of the conference. I got a smart phone a few months ago, and I was pumped that this would be my first academic conference where I could use it to tweet and monitor the twitter feed without having to haul out my laptop, worry about running out of power, or it falling off my lap. And it was great – except for the whole production of tweets aspect. I type SLOW on my phone! And it was near impossible to tweet more than my own words, that is, to tweet links and web pages and references and stuff. By the time I would tweet a link, it was 10 mins later and I wasn’t paying attention anymore to the panel I was at. I was jealous of my colleague Kyle Stedman during the Composing Materialities panel because he had his laptop and was tweeting all the links and stuff, while I was trying to type “#4c13” on my phone for like 30 seconds. Ha. Anyway, interesting that the tools you use matter. It’s really fascinating to here see the conference unfold via selected tweets (and the story that this combination makes). Even though I was *at* the conference, I relied quite a bit on Twitter this time around — so many of the panels I wanted to attend conflicted with my own. Have you visited the Connected Community website? A number of people have been posting their 4Cs paper there as well. Witty and informative. There might be a whole dissertation here! Thanks for the glimpse. I’m not sure how much time I have this second but I smiled constantly while reading your post. Awesome. And thought-provoking. What would the impression of any conference be if constructed from Tweets? On the one hand, I would say there might be pressure to Tweet what you like over what you don’t. It would be pretty confrontational in that context to tweet something like: #thispresentationisshitty. The profession, I guess, would seem to have benefit in presenting itself well. I would imagine, though, that Las Vegas might have taken a Twitter beating given that everyone was at the Riviera. So, I went to the H. Giroux (without accomplishing my own goal of remembering how to say his last name) and I would agree that everyone was fired up. That said, I imagine Twitter overemphasizes the bombastic. His was the kind of talk that makes you feel rude if you don’t stand up to clap at the end. Or the kind of talk that walking out to make a meeting feels more like a political statement than a conference navigation. Don’t get me wrong — I liked the talk and it was packed. It just makes me wonder what a Twitter effect on an academic conference is (i.e. more access? less depth? more focus on the fiery?). I like that Bedford St. Martins was Tweeting. I think they might have spent $100 K on a party on Thursday night. Maxx, you should check out early posts at http://www.hyperboleandahalf.com (if you haven’t already seen them) for an excellent example of hijacking tags to drive traffic. Thanks for commenting! Click here to download my CV as a PDF file. Updated Jan 2019. If you have difficulty accessing any portion of this site, or if you need content in an alternative format, please contact me at mgarcia [at] uwlax [dot] edu.